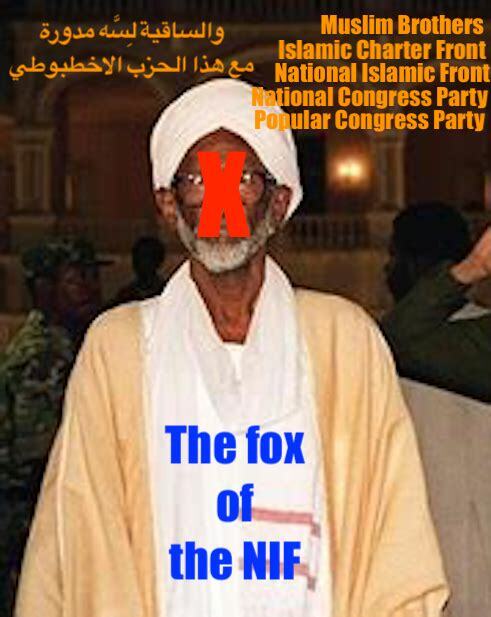 Has NIF, the National Islamic Front in Sudan Dissolved? The NIF, Which is the National Islamic Front is Dangerous! 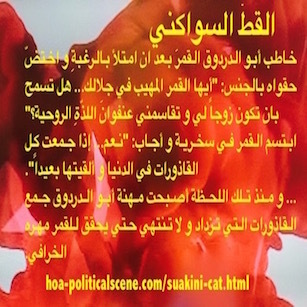 This page exposes all the NIF's foxy tricks to manipulate and mislead the Sudanese people to gain supporters and dominate. 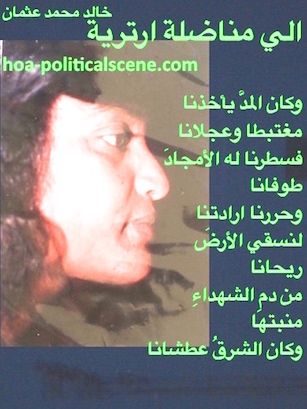 hoa-politicalscene.com/nif.html - Hassan Abdullah al Turabi, the fox of the Muslim Brothers in Sudan. Those are the devil itself and the leads of the International terrorism. The leader of the Muslim Brothers in Sudan Dr. Hassan Abdullah Alturabi is The Godfather of this fronts from the birthday on the 1940s, as the Muslim Brothers Party until the name is changed three times in some three decades, in a policy that I described as the octopus policy of the muslim Brothers of Sudan. See Muslim Brothers octopus in Sudan. To connect the dots on this page about the National Islamic Front (NIF), read the comments that made the entry to the ICC, International Criminal Court's Indictment and Crimes Committed by Sudanese Dictators pages. I intended the first time to post it as comment on those pages, but changed my mind to build it this page because it is long to be just a comment. This political party is definitely a dangerous party, as it amalgamates politics with religion, although many of the members don't care about this religious thing, or simply said they use it to deceive the traditionally Muslims in Sudan. I know many of them who are just normal people and who always sine in their daily life, hunting women, trade in commercials very bad, lie, deceive others and just do anything for their own benefits, even when that contradicts with their Islamic beliefs. The Tactics of the NIF! The funniest thing in their frauds and lies is that when the media accused them of committing the coup under the National Islamic Front at the time, they denied that strongly, although the Sudanese people know of course the members of that party in the coup. They came after that to admit this fact. They chose the name of the Revolutionary Command Council for National Salvation when they stole the political power by night and overthrew the government of the Prime Minister Sadiq el Mahadi, the brother in law of Hassan el Turabi, the leader of NIF. They changed the name of the party to the National Congress Party (NCP). Then they played the division of the party, and the leader of the National Islamic Front announced his party, the Popular Congress Party, or the People's Conference Party. The National Islamic Front, which was the development of the Muslim Brothers and then the Islamic Convention Front respectfully, dissolved after achieving its periodical goals. It is obvious. The two parties played the misleading game since then between them to throw aches in the eyes purposely to make the Sudanese people think they are different. We had a top meeting in the Sudanese Alliance Forces / the political desk at the time to assess the misleading. Some of the members stood against my paper on the issue. Among them was the leader of the political desk who was a medicine doctor. He engaged with them later when he returned to Sudan. I kept asking those members who disagreed with me for proofs that the two parties are not one party with two names. The paper suggested the misleading remains the preferred way for the Muslim Brothers since the independence of the country, giving proofs of the way the party changed its name from period to period according to the demands of that period. 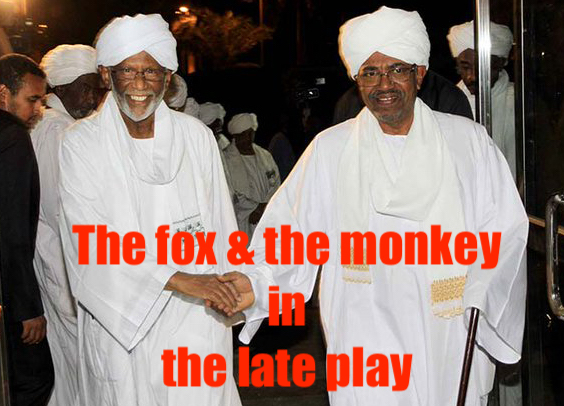 hoa-politicalscene.com/nif.html - NIF: Hassan Abdullah al Turabi, the fox of the Muslim Brothers in Sudan and Omar al Bashir, the monkey in the late theatrical play in Sudan. Burning the political periods in Sudan was and is still to be the strong proof of their presence until this moment. I called it the (foxy party). People in the meeting actually have no open political visions to see things from different angles and compare them together to reach concrete facts. 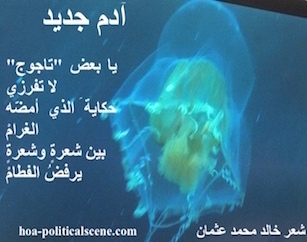 Then the party in the regime accused Hassan al Turabi of plotting against it and detained him. The regime accused al Turabi in fact many times until the authorities arrested him to throw more aches in the eyes. They made him this way an opposition leader, the same way it happened during the uprising of the Sudanese people against the second dictator in the Sudanese history, Jaafar Mohammed Nimeiry (Gaafar an Numerie - Gaafar Mohamed el-Nimeiri - Gaafar Nimeiry - Jafar al Numeri... oh my God I hate this name). 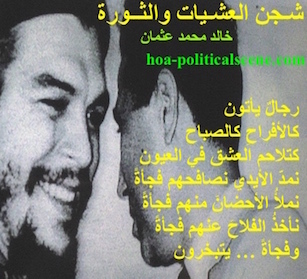 However, they dropped the accusations of plots to overthrow the regime and released him. The masters of the misleading game in Sudan have always bad news as good news and accusations between them as proof to anti behaviours. To strengthen this claim Omar al Bashir accused his mentor saying that the twin forces of Zionism and freemasonry backed al Turabi. 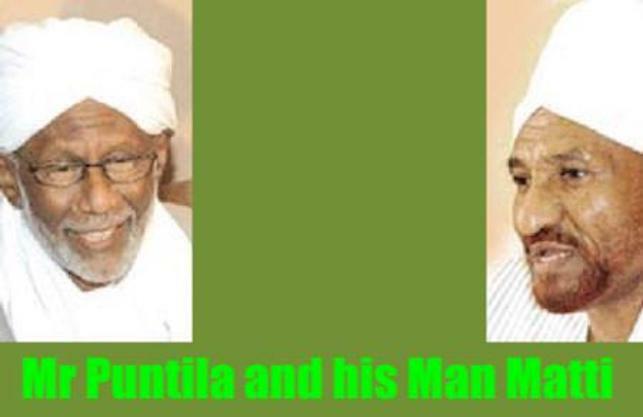 Again, when the Justice and Equality Movement (JEM), the Zaghawa dominated Fur rebel group invaded Omdurman in May 10, 2008, the regime accused al Turabi of cooperation with the rebels in Darfur. They both know that the leader of JEM, Dr. Khalil Mohammed Ibrahim was one of their cadres in the Islamic Front - NIF -. The presence of the Muslim Brothers in Darfur was strong during the sixties. Fundamentalism appeared that time when they supported (Sony), a separatist movement in the western Sudan. Please, bring my attention to this point if I have forgotten something about it. JEM held meetings in Chad, Libya and went even to Israel to strengthen political and military power. The role of Chad in Darfur is planned when the two Islamist groups in Sudan and Chad involved in distrust and organized multi armed groups to face each other. The Sudanese Islamist group supported the Islamists in Chad until they overthrew the government under the same name of the "revolutionary salvation council" their brothers took in Sudan. Al Turabi keeps on talking to the media and saying that he will not keep silent as long as the people in Darfur suffer from the war the regime wage in the region. The news said he used the political problem in Fur region to undermine the government in Khartoum. I should laugh of these jokes! There is nothing in this party regardless to its different names except the frauds and lies. Unfortunately, they call it in this party the Jurisprudence of Necessity and make it "halal", not forbidden in their beliefs. Ordinary Muslim Sudanese know this fact and they make jokes out of it. I have never thought that the National Islamic Front has been dissolved. Use the following form to comment on this page about the National Islamic Front. You can even use the same form to write articles about the NIF. Comments on NIF and other political topics on this page appear below the form. 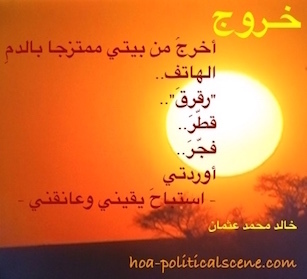 However, there are more comments about the same political topic on this pages at NIF's Political Crimes, NIF's Political Crimes - Comments and Crimes Committed By Sudanese Dictators. hoa-politicalscene.com/nif.html - NIF: Hassan Abdullah al Turabi and al Sadiq Almahadi of Umma Party as "Mr Puntila and his Man Matti" in Bertolt Brecht's famous play. Please, share this page about NIF with your services, like Facebook, Stumbleupon, Google Pages, Yahoo Pages, Live Pages, Myspace etc and tweet it through the following buttons. This could be good experience on how to use this technology. I use SOLO Build It! tools on the text link at the bottom of NIF page to empower the entire HOA Political Scene website. They are great tools.